Capture PhotoCon Phoenix Early Bird Tickets On Sale! 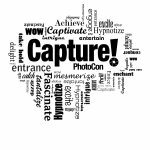 Capture!PhotoCon 2018 Early Bird Tickets on Sale! The Southwest’s newest, most exciting photography conference A CONFERENCE FOR ALL PHOTOGRAPHIC ARTISTS! Expand your creativity. Sharpen your artistic skill-set. Fuel what inspires you. Push past what’s holding you back as a photographer. At Capture! PhotoCon, you’ll meet others with goals and aspirations just like yours, in an unpretentious and energizing atmosphere. Accomplished professionals and groundbreaking creatives will share their tips and insights over three fun-filled days!